Instantly improve your kiosk, food truck, convenience store, or restaurant take-out service with this Choice 16 oz. black 6 1/4" round microwavable container with lid! Coming as a combo, this black container includes a clear, tight-fitting lid for optimal product visibility and protection from messes and spills. It also boasts an ample capacity that's big enough to house your salads, pastas, and small entrees. This is a great product! I have been using these containers every day for four years. They hold up great in the dishwasher time after time. They are perfect for meal prepping lunches! These are the perfect size container. Not too large. We use them to serve oatmeal to go. They are just big enough for the oats, plus toppings without feeling cramped. These bowls ship 150 per case. The bowls are made of a very thin material causing them to stick together. The lid will easily seal 2 bowls as 1 bowl, thus fooling your staff into using 2 bowls per lid. Shipping is an issue due to consistent damage in shipping. You will lose 1/3 of the product, but it's still cheaper than ordering the higher quality 16 oz bowls available. So I chalk up the loss, knowing it will continue. I have not figured out a use for the extra lids and therefore throw them in the recycle dumpster. It would be great if the manufacturer could solve this problem without increasing the price. 3 star rating is for price, not quality. Thank you for your review, Gordon! We are sorry this Choice 16 oz. Black 6 1/4 inch Round Microwavable Heavy Weight Container with Lid - 150/Case has not worked well for you. A Customer Solutions Representative will contact you soon! I really like these microwavable bowls with lids. I use them to store leftovers and also use them for my bakery items. They're a great investment! we use choice 16oz container for our to go food truck orders It is durable and microwavable. i love the apperance of the product. the product is durable and doe not leak. Great product, easy to use! We received product in a great condition and no damage at all. I highly recommend to use it, totally amazing. this box has pretty good quality and very comfortable for customer?i would like to buy it again?I definitely recommend this for everyone who need this style box! These containers are fantastic and practical. They are sturdy and also leak proof! Also sleek and stylish and come in many sizes from small to large. This container can be used to hold hot food. We serve our curries in it. Holds up to 3 servings which is decent size portion. Not too big nor small. Just what I was looking for. I love these containers. They are great for freezer to microwave food- which is what I sell. They are durable and are reusable. I have cut myself on the edge of a lid, but other than they are perfect. We have purchased every size in these containers for our take out restaurant business. Our customers love the fact that they can be used in the microwave, fridge and the dishwasher. Very awesome products. We've been using these containers for a couple years now and they do really well for ready-to-heat products like mac & cheese and pasta & tomato sauce! These round Microwaveable containers are true heavy weight and very durable. Very happy with the quality of this product. Makes a great presentation for our community. These 16oz microwavable bowls are great for soups, salads and small entrees. I love that I can put them in the fridge, the microwave or the dishwasher. They have held up great so far. It also saves so much money being able to reuse them. Love these containers. They are perfect for lunch-to-go, especially if you meal prep. You can just bring these to work, microwave them if you need to and then toss them when you are finished. My first thought was that this really wasn't very big. But when I actually put food in it it was fine. I put two tacos and a 4 oz scoop of rice in it. The choice 16oz containers with lids are very sturdy containers. They are excellent for my side dishes,deserts, and even soup! I will be ordering these containers on a regular basis. I think I have purchased every size these bowls come in and this 16oz round is my favorite. Its just the right amount of food for me. Its sturdy and holds up to many uses. Excellent for bowl meal prepping. 6oz meals fit perfect. I highly recommend if your meals can be stacked (steamed rice with ground beef). I sell my meals and customers are very happy with the size for their lunch packs. I have these containers in 4 or 5 other shapes/sizes! they are great for left overs at our house! when we lose or ruin them its no big deal. this size is honestly probably my least used, but they still get used a decent amount. i do send dips and such home with guests when we have gatherings in this size. works well for that! I will still continue to purchase as i do use them! over all this like of containers its a great substitute for reusable plastic containers for home use! 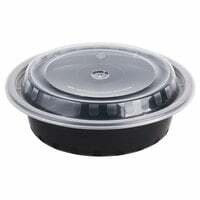 These are nice sturdy take out containers that can be used for restaurants or delis. Lids fit securely to prevent spills. Microwavable and reusable too! I love these containers! They work well for what I need them for......however, they are consistently short on the lids. Last time it was one lid short, this time its two. This is the 3rd container we have used for the same application. Each time we switched because webstaurantstore made a recommendation and we thought the newer/cheaper version was worth a try. This Container and Lid combo is BETTER than either of the previous solutions we have used. Great for both hot and cold foods. Microwavable. And inexpensive! This container is perfect for my needs. I highly recommend to everyone looking for portion size container, is good for side orders like salad or chicken. I've been searching for a good container for my meatballs with maranara and mozzarella (no pasta) and this container seems to fit the bill. Lids fits tight and is sturdy to carry. Plus it looks nice too. We purchased these because we needed a better container answer besides Tupperware. These give us the convenience of single serving leftovers. And at this price point, there are no worries about sending leftovers home with our guests. These containers are a constant in my takeout business. My customers love the convinience of having a sturdy container that holds up even after running them in the dishwasher. Win win! Very sturdy product that holds up well even in the dishwasher. I use these for meal prep and storage. Amazing quality for an even better price. The best item we've found! These bowls are awesome. We use them to prep meals in and they are able to be frozen, refrigerated, microwaved and they are dishwasher safe. This is an added perk for our end consumer as they now have a new disposable bowl for home use. These small containers are perfect for people who like to eat 6 small meals everyday and do meal prep. I love these bowls and the black is a very sleek color. Great price, great quality. This is a great container for meal prep. I love how ecconomical they are, you can afford for them to be disposable even though they are microwave and dishwasher safe (at least residential dishwasher safe). This size container is good for folks on a diet. The Choice 16 oz. Black 6 1/4" Round Microwavable Heavyweight Container with Lid is a great addition to any kitchen. It is perfect for leftovers. These vi raiders are amazing for meal prepping. They are dishwasher friendly and microwave safe. They are a great size to hold 3-6 ounces of meat and s side! These are my favorites! Received product and it's all that I needed to start me take out service my customers enjoyed the products. I will order this product again. These are a great use for my childrens hot lunches for school and my husband for work. I like the fact that they are reusable and doesn't melt while warming up their food. I have been using these bowls for a littls over a year now and I must say that these bowls are amazing. They can be used for hot or cold items. I love my containers. I've used them over and over again. Great quality and easy to store in cabinets and refrigerator. I've already placed another order in a different size. We have found that these containers work great for TO GO soups, salads and appetizers. This is one of only 2 types of TO GO containers that we use. The lids snap on and fit tight. The are microwaveable but will not sit under a hot heat lamp long without warping and become difficult to fasten. All in all, a great product. These are great containers, they're microwave safe and the lids snap really tight to help prevent against spillage, our clients love them, reusing them many times and say they're top shelf dishwasher safe. Good container. We use it for noodle bowls for grab and go in our cstore. none of my Canadian suppliers can beat this price even with shipping. Buy a lot to make shipping worth it. Great product folks. Perfect containers. They are sturdy and very convenient. We use them at our cafe for take out orders of our rice bowls, they make the dish still look delicious! Thank you we will be purchasing these again! These work great for when I do meal deliveries, They can be reheated well, and they hold up to hot food well, I have used them for just about everything, Customers enjoy that they can be reheated and are dishwasher safe. I just purchased more of these containers for food storage and take out. These are great microwavable containers, and perfect for lunch take out. I make lunches in advance and keep them in the fridge and microwave them for a hot meal at lunch. They're also great for basic food storage as well. the lid is tight and doesn't leak wet contents when tipped over. I highly recommend these containers. Great containers for hot and cold meals. We use them to sell our meals, either in the deli cooler or in the warming case. Strong and seal tightly. Love these microwaveable containers. We checked out other ones, but we really like the quality. The round circle on top of the lid is the perfect size to place our small label on top for our business. The price is good too. I love these containers! This size is perfect for a small meal in the go...It is a bonus that they are also microwaveable and dishwasher safe. These bowls are excellent, I bought for my work as well as for the house, the covers seals great that leaves you with no leaks , easy to close and to open, many sizes to choose from. Great size for your usual leftover portion. I also use these for meal preparation and delivery. A great size for portion controlled salads and one pot meals. Sturdy containers. Lid locks well. Can clean and reuse. This containers are working out great for meal prepping. They are strong and durable. I reuse them several times before disposing and that's awesome for me.